Really happy with these. 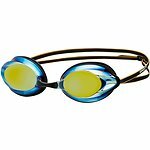 I bought a different pair of speedo googles a few years ago and they always leaked and overall just didn't' sit well around the eyes and nose. So i was a bit sceptical of getting another pair of speedo googles. But these ARE THE BEST EVA. Could not recommend enough. i'm thinking of buying another pair to lend when others join me instead of being embarrassed lending them old leaky ones.